Are we ready for the next Hurricane Sandy? New York architect Marion Weiss, of Weiss/Manfredi, discusses the new reality of designing buildings, infrastructures and parkland when weather patterns are no longer predictable. This week marks the first anniversary of Hurricane Sandy, which pummelled New York and New Jersey and extinguished the lights on lower Manhattan, as immortalized by Iwan Baan’s cover and photos for New York magazine. 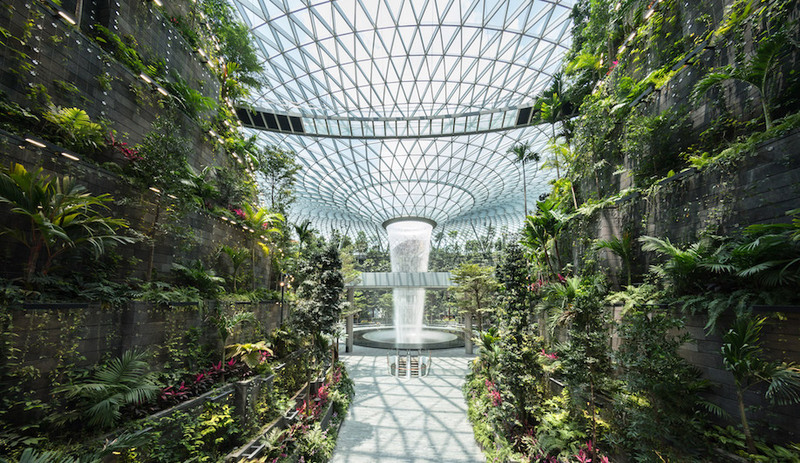 Architects, planners and concerned citizens have launched exhibits, discussions and competitions with the aim of identifying ways to make the region – and any area vulnerable to climate change – more resilient. 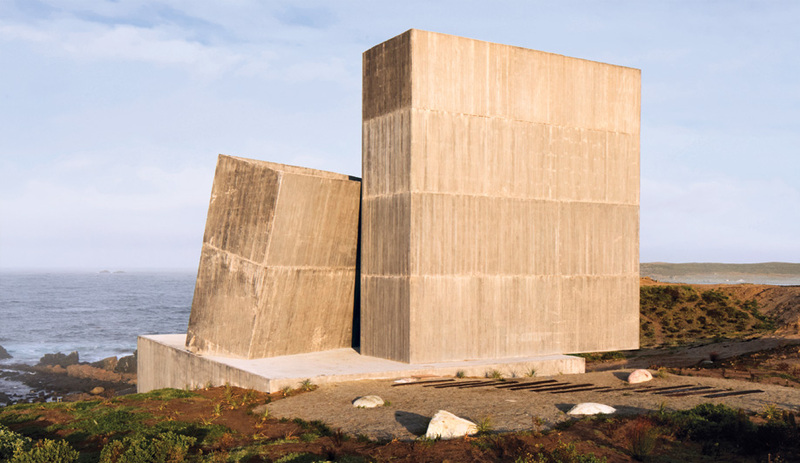 Earlier this year, we talked with Marion Weiss of Weiss/Manfredi, which since its founding in 1989, has considered architecture and the natural environment as a couple that should not be kept part. Most of the firm’s projects centre on the seamless blending of the two. Among its most lauded projects is the Olympic Sculpture Park in Seattle, a dramatic landscape that zigzags through a former industrial wasteland, turning it into a pristine park along the water’s edge. 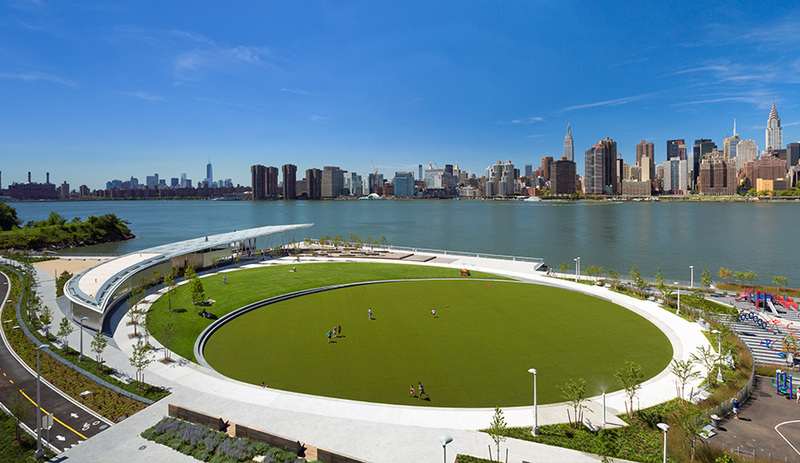 This summer, the ribbon was finally cut on Hunter’s Point – a 30-acre mixed-use development designed with Thomas Balsely Architects and located along the East River in Long Island City. The waterside site incorporates parkland, affordable housing and community facilities along with an elaborate water management system designed to curb the damage of future flooding from rising tides and flash disasters like Hurricane Sandy. Hunter's Point South Waterfront Park. Photo by Albert Večerka/Esto. Azure: When you and Michael Manfredi opened your office 24 years ago, climate change wasn’t in the foreground of people’s thinking. Marion Weiss: Not at all. It’s interesting because extreme climates are happening with such consistency that people are recognizing that embedding resilence into design is not an extra thing to think about, it’s a necessary thing. 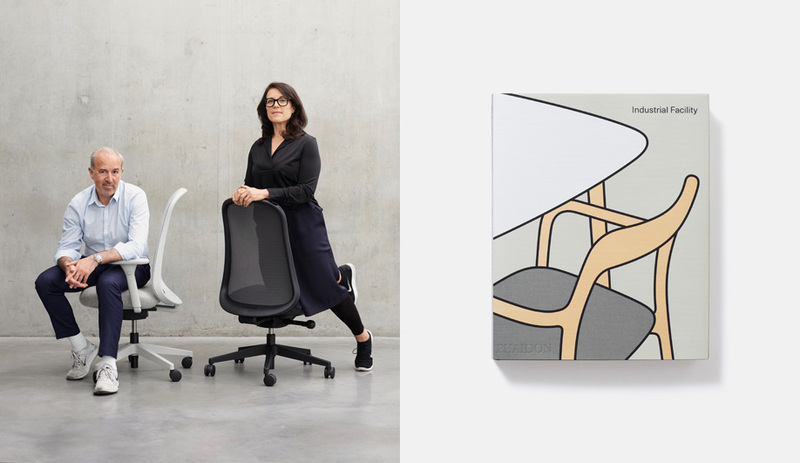 It’s also a necessary thing to think about creatively and at the beginning of the design process, as opposed to reactively, after something has happened. AZ: You are in a great position to embrace this way of thinking because you’ve always considered buildings and their surroundings as integrated. MW: Natural systems and urban systems need to be seen as reciprocal rather than operating in separate columns. The question we get often is the investment of this logic. It can be costly to do both. So, how can you invest less and have it do more work? For instance, with the Olympic Sculpture Park for the Seattle Art Museum, the sea wall was failing and the forecast for repairing it was anywhere between $40 and $70 million. 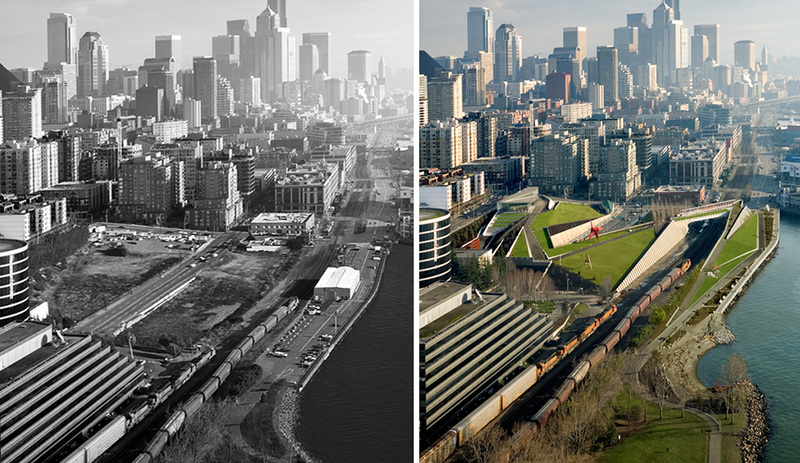 Seattle's Olympic Sculpture Park, before and after. We realized we wouldn’t be able to develop that parcel of waterfront without stabilizing the sea wall, so we worked with engineers to simultaneously reinforce it and create a salmon habitat through a series of habitat benches. We did all that on $5 million. Being able to do more and have it cost less is something that gets people listening, and I think there is now more traction with the things we have been interested in. With events like Hurricane Sandy, climate change is something we are being reminded of with greater and greater frequency. AZ: Have you seen a tipping point, when people started to think seriously about climate change as an essential part of building for the future? MW: Hurricane Katrina in New Orleans was a tipping point. What we’re seeing now is more sustained tsunamis and floods, hurricanes, earthquakes and 100-year storms that are happening in five-year frequencies. Now we are wondering, along with FEMA (Federal Emergency Management Agency), what should we be anticipating? FEMA is just coming out with their guidelines as to what elevation statuses are appropriate, and those changes are now going to be affecting the standards for new construction in sites near water. We actually think that all this quantification of knowledge helps of us as designers, to readjust what was in our peripheral vision to a more central vision, and maybe we can actually be incredibly creative with it. AZ: Should architects be building for weather conditions we’ve never experienced before, and how do go about preparing for the unimaginable? MW: My father was an aeronautical engineer who helped design things like the space shuttle and satellites. He designed for the “knows,” but then he also designed of the “unk unks,” which are the unknown unknowns. You need to identify the Darwinian challenges to be more extreme than you can imagine. We need to up the ante because there is also the issue of multiple, simultaneous risks that create events like Hurricane Sandy. With Sandy, we had a moon, we had a high tide, we had high winds, we had a whole collection of things that had an unprecedented and amplified impact. That’s what we need to design towards. AZ: Has this thinking moved into the collective conscience? Are competitions, for instance, now seeking solutions for a new climate reality? MW: It’s not always a pressing issue. For urban locations near water, yes. I would say most competitions now have a desire to be sustainable, but that’s a word I’m bored with already. Resilence is much more interesting, so that it doesn’t get quantified with a check-list that includes things like bicycle racks. We value those things, of course, but there are a lot of other things those lists don’t capture. We aim for LEED status, which may or may not be documented. 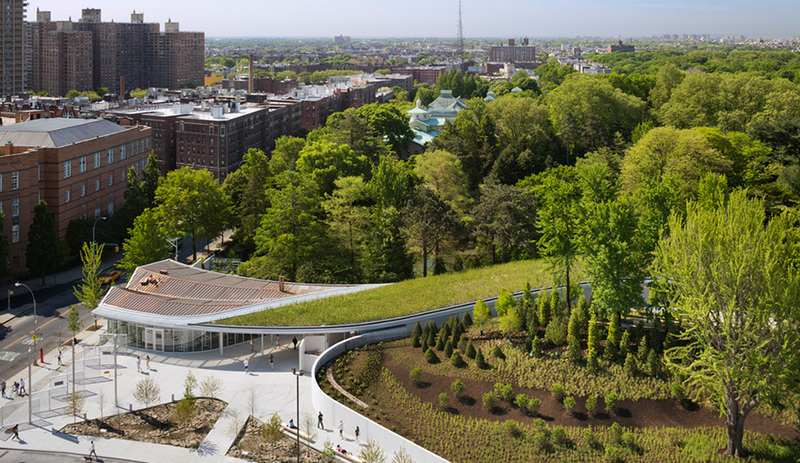 Two of our recent projects, including the Brooklyn Botanic Garden Visitor Centre, which opened in May, are LEED Gold. It’s still important to recognize sustainability, especially for institutions that want to make that information public. In that regard LEED is very valuable, but it’s a narrow tool and there are so many things we need to think about with more rigour. Brooklyn Botanic Garden Visitor Centre. 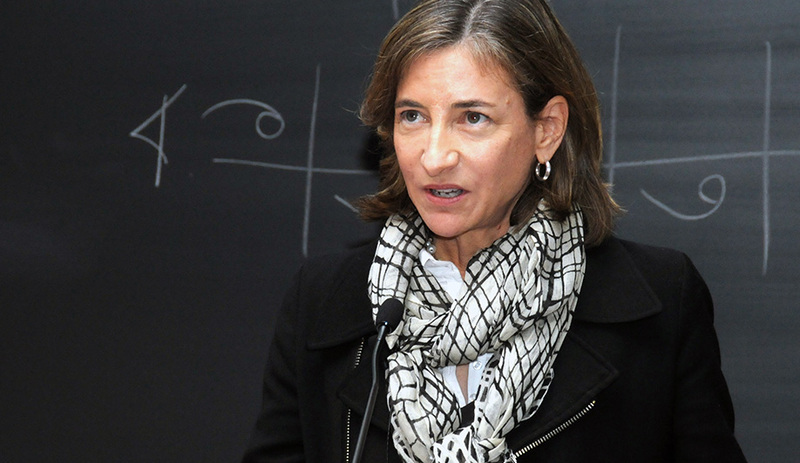 Photo by Albert Večerka/Esto. AZ: Is working beyond LEED a harder sell? MW: For those who are already thinking about resilence and are committed to it as a design element, it’s not at all. It might not be part of their budget, but they do want to think about how to get there. AZ: How do you see you firm fitting in with this new reality? MW: We’re interested in the precision of that intersection, to allow the architecture to rest lightly on the land. But to do that you might have to reshape the land that it rests on. It’s never about shying away from form making, but rather understanding what form will have the most impact with the least damage to systems that have a desired effect, of passing through or going by. We aren’t interested in changing the world where we set a building down and everything around it defers to it, but to actually try and improve things that go well beyond the scope of the territory. 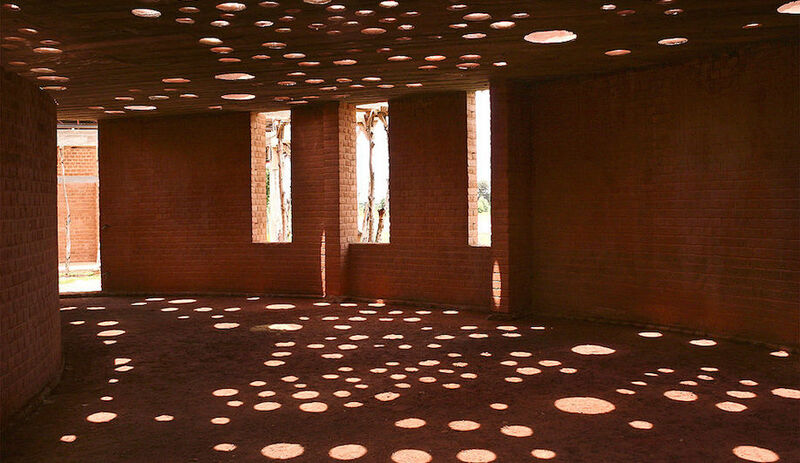 Marion Weiss was a guest speaker for the Bulthaup lecture series, held at the John H. Daniels School of Architecture at the University of Toronto, February 2013.